Ul Iymist - (Old Nose) - A plywood replica of a Chinook canoe. I made this canoe in 2002 for Tony Johnson of the Chinook Tribe. He did the finish carving of the nose & tail and surface texture carving of the gunwale. He also painted the canoe. Ul Iymist is a very accurate 7/8 scale representation of the Scarboro Canoe at the Oregon Historical Society. Tony and I spent a day taking the lines of the Scarboro canoe which was carved by a Chinook carver near Scarboro Hill at the mouth of the Columbia River around 1900. Tony has been my primary advisor about these canoes. His help has been absolutely essential. The canoe was built with the taped-seam plywood method. Tony gave me a block of cedar from a centuries old cedar tree from Chinook land for the nose and tail carvings. 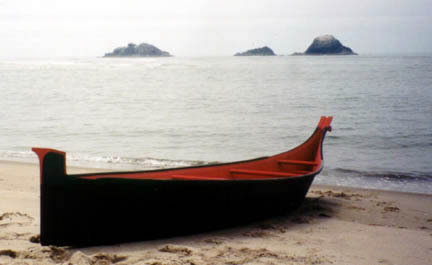 He named the canoe "Ul Iymist" which means "Old Nose" in the Chinook language. We learned a lot from the old canoe, especially about how the early carvers blended the flat sections of middle of the hull into the sharp fin-like hull ends. I made an identical canoe for Tony's father Gary Johnson, former chairman of the Chinook tribal council. Ul Iymist has traveled in many of the annual paddle journeys. We had an informal race between Ul Iymist and Aludaq at Coos Bay. Both canoes normally have a crew of 4 pullers. Ul Iymist won handily but the average age of the Chinook pullers was significantly less that those in Aludaq (my old self included). The question of which is faster is still a matter of cheerful contention. Later hat day Tony loaded this canoe with a total crew of six. It stormed along at high speed, low in the water, pushing a big bow wave like a black battleship. I don't think this would be practical in open water, but it looked impressive. Tony has had Ul Iymist in the surf at the mouth of the Salmon River here in Oregon. They were able to cross the bar through the surf and land through the surf at a beach down the coast. On the return trip they greatly surprised a group of modern kayakers who probably did not expect to see a long black Chinook canoe to appear around the headland. At one point, as they were practicing surfing, a following breaker kicked the stern sideways and spun the hull crosswise to the wave. Normally this is called broaching. The usual result is that the canoe flips over sideways in the surf like a rolling log. However Ul Iymist stayed upright, thanks the wide flaring sides and some quick corrective action by the crew, and surfed sideways across the wave face. This shows the fantastic performance that comes from the centuries of research and development by the people on this coast. Tony Johnson & crew heading out in Ul Imits at the mouth of the Columbia River. They are using traditional Chiook paddles.